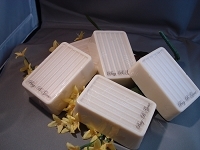 Goat's Milk is used because the higher fat content moisturizes your skin naturally, we add Extra Virgin Olive Oils, another skin care naturals...our soaps will not dry your skin like most other soaps. Hand poured in the Ozarks using spring waters,fresh Goat's Milk, Extra Virgin Olive Oils. Our products are crafted with pride and dedication in The USA. 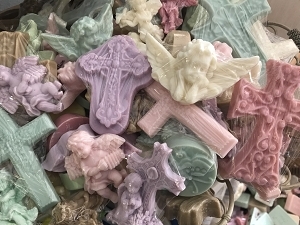 Check out all the different scents and motifs you can choose from. When you choose your favorite motif, we will select your soaps especially for your from that grouping, some of which are shown on the website and other special designs are here in the shop! Available in your choice of scents and motifs. Sizes vary from 4 to 6 oz. Our goat's milk soaps are are crafted with pride and dedication by artisans here in The USA. 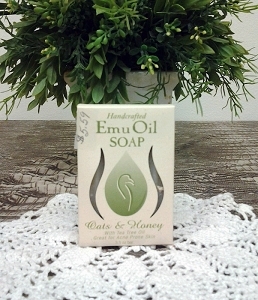 Our soaps are FREE OF sulfates, paraffin, petroleum and phosphate 3 which are commonly found in other soaps. We offer unscented as well as a wide variety of beautifully scented options that are sure to make your bathroom smell fabulous while at the same time making your skin soft and beautiful. Try a new scent every month! 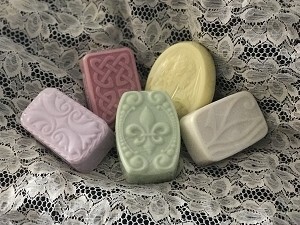 When you choose your favorite motif, we will select your soaps especially for your from that grouping, some of which are shown on the website and other special designs are here in the shop! 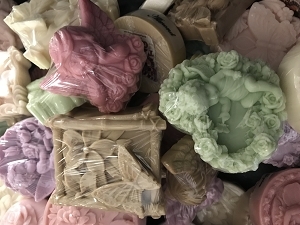 Remember to purchase extra bars of our wonderfully scented soaps and store them in your closets, dresser drawers and nestled in among your linens so you can enjoy the wonderful fragrances throughout your home. 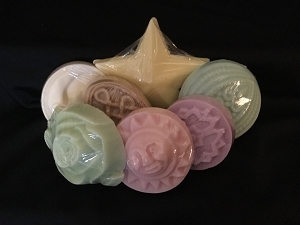 Our artisan soaps make wonderful gifts for all the important people in your life.